Clearly, doing these releases with these names and marks is a really good way to make a good buzz in the world of rum’s geek. That’s mythical names isn’t it ? Of course, that’s not rums from Albion or Skeldon… the two distilleries are closed since 1968 for Albion and 1960 for Skeldon. It’s in fact just about profils, receipes… They call that Marks. These marks are only there to indicate what’s in the cask. 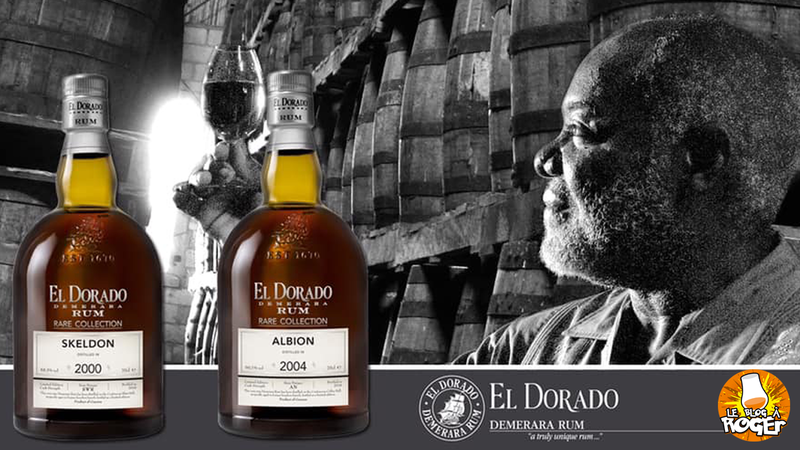 Cause with their blends (el dorado 12-15-21), they need different rum profiles and so it’s important to know what’s in the cask (taste all of them should be a good idea too, but not sure really convenient). Behind each marks, there is some different yeasts, several pot stills, different fermentation duration, different settings etc etc.. There is a crazy article that explain all of that here. The bible for all demerara fans ! So, stop with bla bla, let’s go tasting what’s in the glass ! With 14 years of aging in the hot warehouses from Diamond, this Albion was distilled in 2004 et bottled in 2018 at 60.1%. The mark is AN, as the one from 1994 bottled by velier. Nose: Fruity, really fruity with banana, apricot and some coconuts. Camphor, eucalyptus, caramel, chocolate, iodine, thiny wood, tabacco, roasted bread and caoutchouc ends the pleasant nose. It smells like molasses but not too much… just what’s needed. Palate: a vivid and sweet attack … it really sticks to the teeth this stuff! Molasses, caramel burned, toasted, the bitterness of blood orange, it’s really generous. Menthol and milk chocolate come back as well as vanilla notes. The alcohol is rather well melted to the whole. Unfortunately, the rum is present but tends to go out quickly enough even, if it leaves us a small rubber tip relatively familiar with the Albion. Conclusion: A very fragrant and generous nose and a mouth quite consistent with this first one. After the lack of length is pity … but it’s still a very pleasant moment. So here, we come back from mythical one …. the last (and probably unique) rums having one day borne the name Skeldon are the two versions proposed by velier. Having never had the happiness to test these two monsters, I suggest you check here and here what Cyril thinks. Skeldon was therefore a sugar plantation that included a distillery, as there was a lot at the time. The mark SWR is the same as the two versions velier, a unique chance to be able to get an idea of ​​what it could be (or not?). Getting touch to the versions velier being just impossible in 2019, unless you have a good package of euro to “invest” or a right in (very) great shape. Nose: more closed, more wooded than the albion, this one does not remain any less good, it just needs more time. The grilled molasses and burnt caramel appearance is there as on the AN, with a wooded side put forward as well as gunpowder. The fruits are recessed but with time the banana arrives with the big blood orange. The dark chocolate powder but also the mint and beautiful roasted notes come to complete the whole. The set seems heavier, more austere than the Albion but it’s really not to displease me in fact. Palate: pwaaa, it’s fat, captivating, woody, chocolatey, can be less sickening than the albion, more robust too. A delicate bitterness is present intermixed with spices and always this aspect burned, grilled. Vanilla, salted butter caramel and a slightly maderised side complete the picture. The length is much more impressive than that of the Albion. Conclusion: more austere, robust and heavy than the Albion, this one seems to me more accomplished although more linear without aeration. The generosity it releases in the mouth with this superb bitterness is really nice … after, it costs a lot. Come back of the year ? DDL clearly played on the buzz that could offer these two names, I think they are attentive to what is said on different social networks and other auction sites. Albion and Skeldon are the two names on which fans get excited the most, clearly. Anyway, after 2 Enmore and 2 Port Mourant, they could not offer us that yet. I would say that this third release of “rare collection” seems to me the most accomplished, even if the Albion does not manage to rise to the level of the Velier of 1994. But that’s clearly very good rum, the only thing that could scare is the price, For me it’s too high.